I’m back! Tons of thanks to Cube for helping me with my predicament. Yes, the heat really did go out next. But really, my computer does keep the room warm enough. According to Adam it’s the warmest room in the house. 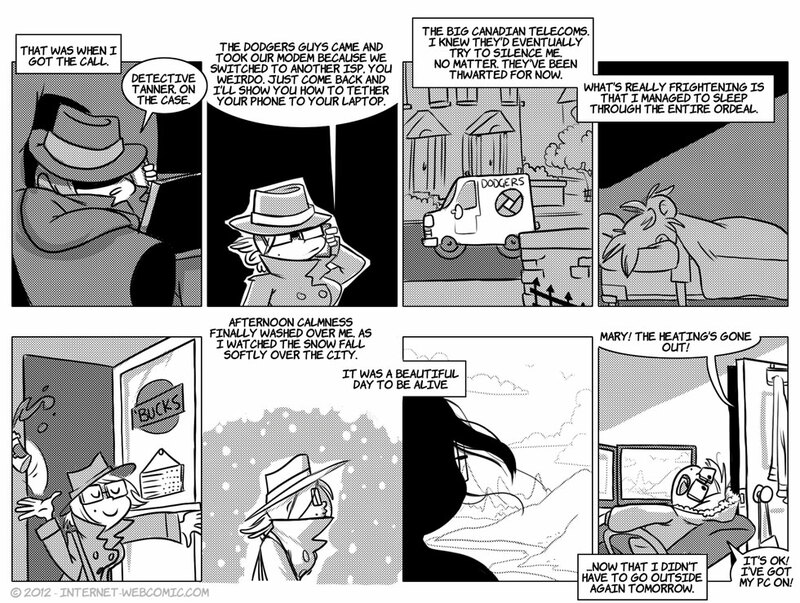 While it was nice to break into something with a little bit more staging and general artiness like film noir comics, these 8 panel strips are exhausting, and need to stop. IMO, I could have easily broken this one up into 6 4-panel strips- but that’s too many thematic updates. Don’t want to get too into storylines now! I tethered my phone to my laptop once. It was slow, but better than nothing. Mine’s pretty fast, but the 1gb/mo cap is pretty suffocating on a normal PC. On a related note, apparently our heat never worked in our apartment. We just didn’t realize until we packed up our computers to move out. Hahahahahahaha! A pc is a great heat source! I never turned on my heat of the whole winter!